Paharganj is one of the most alternative market spaces in Delhi. Lined with novel concept stores and and unique ideas, there’s so much more than what meets the eye. From a wall adorned with all the bangles you could possibly imagine, to raw crystals in their purest form, there’s so much to buy. Paharganj has left no stone unturned in its love affair with all things silver and semi-precious, and we’re telling you where to head. Their pieces are brought in by Afghanistani traders and the skilled workmanship on these is unlike anything you’ve seen in Delhi. They are truly one-of-a-kind, and the signature colours used are blues and the occasional yellow tones. 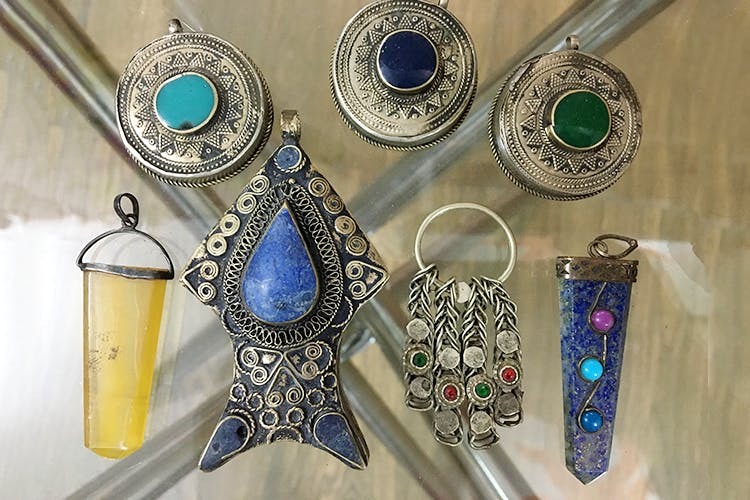 The pendants are made of silver chains with semi-precious stones found in the Afghanistani region. Hoop earrings remain a wardrobe staple, and Durga Art takes this requirement further by showcasing the most extensive and creative hoop earring collection. These are all set in real silver with embellishments galore. The selection is endless and trying to choose just one will make your head go round! They offer the most unique collection of jewellery. Crystals gathered straight from the Himalayas are used in their raw forms to make anything, ranging from a necklace to an intricate headband. The sheer craftsmanship and product design is enough to make you want to purchase the entire line of jewellery. As an added bonus, the crystals are said to have healing properties. What first strikes you is a narrow staircase winding upwards, with an entire wall adorned with bangles. Virender Art Emporium has managed to capture all the colours of the rainbow, matched them with silver or gold and created the most gorgeous array of bangles. Priced so reasonably, it’s hard to go home without a bagful of bangles!